Within the genetic news flow, there is often, and rightly so, much celebration when a gene for a disease is identified. This is indeed an important first step, but often, the slogging from that point to a treatment – and the many small breakthroughs along the way – can go unnoticed. One reason why these 2nd (3rd, 4th, 5th …) steps are so difficult, is that in some cases, folks who carry “the gene” variant for a particular disorder, do not, in fact, display symptoms of the disorder. Huh? One can carry the risk variant – or many risk variants – and not show any signs of illness? Yes, this is an example of what geneticists refer to as variable penetrance, or the notion of carrying a mutation, but not outwardly displaying the mutant phenotype. This, is one of the main reasons why genes are not deterministic, but much more probablistic in their influence of human development. Of course, in the brain, such complexities exist, perhaps even moreso. For example, take the neurological condition known as dystonia, a movement disorder that, according to the Dystonia Medical Research Foundation, “causes the muscles to contract and spasm involuntarily. The neurological mechanism that makes muscles relax when they are not in use does not function properly. Opposing muscles often contract simultaneously as if they are “competing” for control of a body part. The involuntary muscle contractions force the body into repetitive and often twisting movements as well as awkward, irregular postures.” Presently there are more than a dozen genes and/or chromosomal loci that are associated with dystonia – two of the major genes, DYT1 and DYT6 – having been identified as factors in early onset forms of dystonia. Now as we enter the era of personal genomes, an individual can assess their (own, child’s, preimplantion embryo’s!) genetic risk for such rare genetic variants – whose effects may not be visible until age 12 or older. In the case of DYT1, this rare mutation (a GAG deletion at position 946 which causes a loss of a glutamate residue in the torsin A protein) gives rise to dystonia in about 30-40% of carriers. So, how might these genes work and why do some individuals develop dystonia and others do not? Indeed, these are the complexities that await in the great expanse between gene identification and treatment. An inspection of the molecular aspects of torsin A (DYT1) show that it is a member of the AAA family of adenosine triphosphatases and is related to the Clp protease/heat shock family of genes that help to properly fold poly-peptide chains as they are secreted from the endoplasmic reticulum of the cell – a sort-of handyman, general purpose gene (expressed in almost every tissue in the body) that sits on an assembly line and hammers away to help make sure that proteins have the right shape as they come off their assembly lines. Not much of a clue for dystonia – hmm. Similarly, the THAP domain containing, apoptosis associated protein 1 (THAP1) gene (a.k.a. DYT6) is also expressed widely in the body and seems to function as a DNA binding protein that regulates aspects of cell cycle progression and apoptosis. Also not much an obvious clue to dystonia – hmm, hmm. Perhaps you can now see why the identification of “the gene” – something worth celebrating – can just leave you aghast at how much more you don’t know. That these genes influence an early developmental form of the disorder suggests a possible developmental role for these rather generic cogs in the cellular machinery. But where? how? & why an effect in some folks and not others? To these questions, comes an amazing analysis of DYT1 and DYT6 carriers in the article entitled, “Cerebellothalamocortical Connectivity Regulates Penetrance in Dystonia” by Argyelan and colleagues [doi: 10.1523/JNEUROSCI.2300-09.2009]. In this article, the research team uses a method called diffusion tensor imaging (sensitive to white matter density) to examine brain structure and function among individuals who carry the mutations but either DO or DO NOT manifest the symptoms. 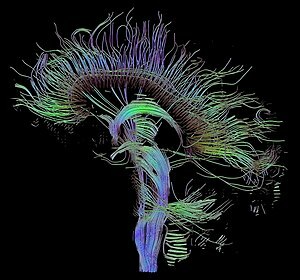 By looking at white matter tracts (super highways of neural traffic) throughout the brain the team was able to ask whether some tracts were different in the 2 groups (as well as a group of unaffectd, non-carriers). In this way, the team can begin to better understand the causal pathway between these run-of-the-mill genes (torsin A and thap1) and the complex pattern of muscle spasms that arise from their mutations. To get right to the findings, the team has discovered that in one particular tract, a superhighway known as “cerebellar outflow pathway in the white matter of lobule VI, adjacent to the dentate nucleus” (not as quaint as Route 66) that those participants that DO manifest dystonia had less tract integrity and connectivity there compared to those that DO NOT manifest and healthy controls (who have the most connectivity there). Subsequent measures of resting-state blood flow confirmed that the disruptions in white matter tracts were correlated with cerebellar outflow to the thalamus and – more importantly – with activity in areas of the motor cortex. The correlations were such that individuals who DO manifest dystonia had greater activity in the motor cortex (this is what dystonia really comes down to — too much activity in the motor cortex). Thus the team were able to query gene carriers using their imaging methods and zero-in on “where in the brain” these generic proteins exert a detrimental effect. This seems to me, to be a huge step forward in understanding how a run-of-the-mill gene can alter brain function in such a profound way. Now that they’ve found the likely circuit (is it the white matter per se or the neurons? ), more focus can be applied to how this circuit develops – and can be repaired.